The previous page illustrated how the costs of storage could make intermittent renewables prohibitively expensive even at relatively low levels of penetration into the grid – a point which is almost unanimously ignored by renewable energy activists and their misleading grid parity graphs. Even though graphs such as the one below might be true for utility scale solar (not the rooftop solar suggested) in some of the sunniest regions in the US, it will only be relevant as long as intermittent renewables remain very small marginal sources where the intermittency issue is negligible. For a more objective view of electricity pricing, click here. Unless we witness some of the long-awaited miracles in energy storage relatively soon, we will reach the point where storage costs inflate the price of intermittent PV by a factor of 4 (the factor by which thermal power generation inflates the cost of coal energy) already quite early in the subsidized deployment process. As discussed previously, this could happen somewhere around a penetration rate of 20%. The remainder of this article will work from this benchmark where intermittent PV is valued similarly to unrefined coal. In other words; the four graphs presented below will present the installed PV price necessary to reach parity directly with unrefined coal – an assumption motivated in more detail in a previous post. 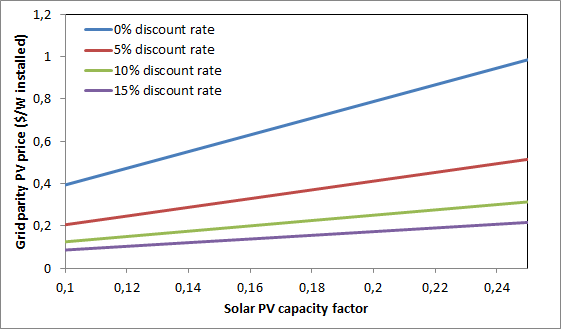 Each graph will present the influence of a selected variable as a function of the PV capacity factor (i.e. the location chosen for the PV installation). 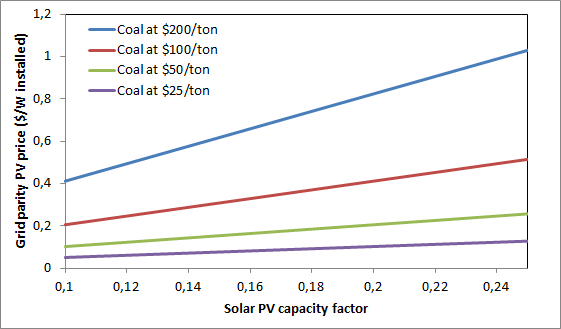 The four variables in question are the coal price, the PV panel lifetime, the PV discount rate and a CO2 price. Unless otherwise indicated in the graphs, these variables are set to $100/ton, 30 years, 5% and $0/ton respectively. Although it kept a much lower profile, the price of coal rose with the oil price during the build-up of the great credit bubble that popped in 2008 and has been at historic highs ever since. It is therefore clear that the price of coal can vary substantially. 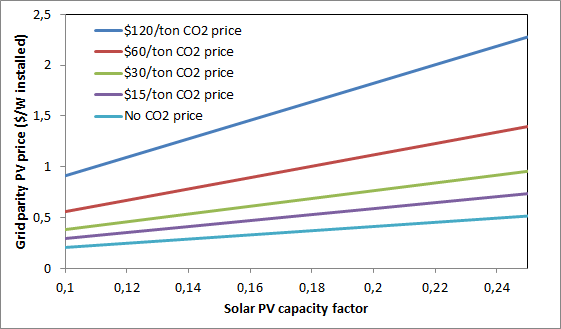 The influence of four coal price scenarios on the PV grid parity price is shown below. 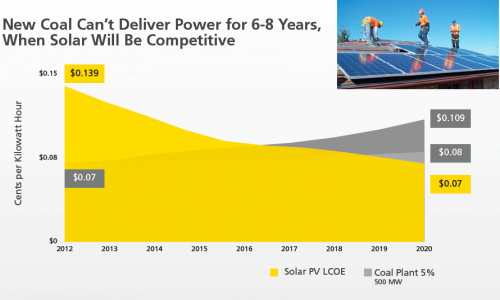 If global coal demand was to continue its rapid rise in recent years and drive the price up to $200/ton, solar panels installed in the best locations could achieve grid parity with coal at as much as $1 per watt installed. Given that global economic growth is heavily dependent on cheap production in China, however, it seems unlikely that demand could continue to grow if coal prices rise significantly from current levels. This will not stop us from trying though. 1200 GW of coal capacity is currently being proposed worldwide (76% in China and India). For perspective, this is roughly two orders of magnitude greater than the total global installed PV capacity (when adjusted for capacity factor). On the flipside, in the highly unlikely event that alternatives start to rapidly crowd coal out of the global market, the price will fall quickly, possibly even back to historic lows of $25/ton. At this price level, the required installed PV prices really look like a matter of complete impossibility. Note that this could also happen in the much-less-unlikely event of another global recession. Solar panels degrade over time and eventually become so inefficient that they have to be retired. For the sake of simplicity, this analysis neglects degradation and assumes a constant output over the entire operational lifetime. Thus, in reality, a 30 year panel lifetime assumed in this study would be equivalent to 33 years at a constant 0.5% degradation rate and 36 years at a constant 1% degradation rate. 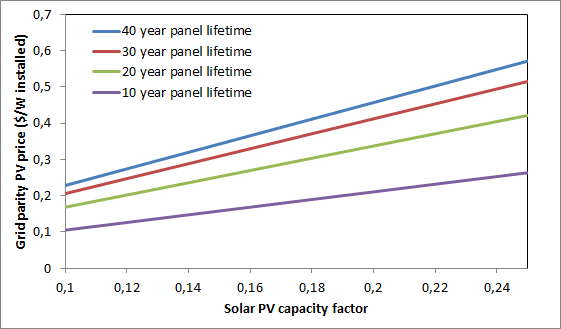 The influence of PV panel lifetime is shown below. As shown in the graph, longer panel lifetimes do not really improve the situation much. This is because of the 5% discount rate implemented. In real-world terms, this simply implies that we do not value the energy that a solar panel might generation between 35 and 50 years from now very highly. The shorter panel lifetimes might be more topical to consider though. For example; third generation organic PV cells would have shorter lifetimes, but have the potential to become substantially cheaper than the current first generation panels being deployed. Currently, these cells still struggle with low efficiencies and very short lifetimes, but it appears as if significant headroom for improvement still exists. On the other hand, recent reports of defective Chinese panels appear to suggest that the rapid margin erosion of PV manufacturers was not only made possible by additional government support, but also by quality compromises. It is therefore possible that the average PV panel on the market today could turn out to have a significantly shorter lifetime than expected. As shown by the purple line in the above graph, this would significantly worsen PV prospects. The discount rate on PV electricity is represented by the interest rate a developer would pay on the loan taken out to finance a solar farm. This interest rate depends on the basic interest rate charged by central banks (which, due to sluggish growth, is near zero at present) and the risk premium charged by banks. Currently, solar PV is perceived as a relatively safe investment (due to government guarantees) and the 5% real interest rate assumed in this study should be fairly representative. It is clear that the discount rate used has a significant impact on the competitiveness of PV with coal. If governments could somehow convince banks to lend to PV developers at a 0% real interest rate, solar PV would reach parity with coal at $1 per watt installed in the best locations. On the other hand, if the economy turns down leading to further retroactive feed-in tariff cuts (such as those in Southern Europe), the risk premium charged by banks will rapidly increase. The discount rate can indeed have a very large influence on our energy future by making large and relatively sudden changes to the effective costs of various capital-intensive energy technologies. For example, this effect is directly responsible for the recent headlines claiming that wind is now much cheaper than coal in Australia. We will have to wait and see what happens to this scenario when wind runs into the intermittency problem. The free market system is good for many things, but, due to the short time-horizons of participating parties (us), it really is hopeless when it comes to combating climate change. Thus, if we are to have any chance of preserving our living environment for the long run, we have to put a price on CO2 so that the free market will start to allocate serious capital towards curbing emissions. By 2035, the IEA New Policies scenario projects a CO2 price of around $45/ton in developed nations and $30/ton in China. However, this scenario is projected to still lead to long-term atmospheric concentrations around 660 ppm which could have catastrophic consequences. As an alternative, the IEA proposes a 450 ppm scenario where CO2 prices rise to $120/ton in developed nations and $95/ton in developing nations by 2035. These possibilities are investigated in the graph below. It is clear that a CO2 price greatly improves the prospects for solar PV. However, the same arguments about global economic growth which were raised in the discussion about the coal price are valid here. A very high CO2 price (leading to a very high coal price) will stifle growth and create political opposition to this price. However, if carbon tax revenues are directly deducted from income taxes, growth could continue until the point where cleaner (but more expensive) new energy sources reach a higher penetration rate. It is also important to mention that, in this case, solar PV will compete with coal+CCS which, with current first generation technology, can abate CO2 for a cost of around $40/ton. Second generation technology promises commercially available CCS for about half this price in about one decade’s time. This implies that coal’s position is unlikely to worsen beyond the green line in the above graph when very high CO2 prices are eventually imposed. This brief analysis has hopefully demonstrated that, realistically speaking, intermittent renewables are still a very long way from challenging fossil fuels as the preferred global energy source. In 2011, only 10% of the global increase in energy consumption came from renewable sources other than hydro compared to 65% from coal (BP statistical review). It should also be pointed out that wind and solar were valued equally to steady baseload electricity through conversion to primary energy (a factor of 2.6 increase) – a calculation which is valid while intermittent renewables remain a very small marginal source, but increasingly invalid from this point onwards. Finally, I should clarify that the aim of this series of articles is not to say that all renewable energy is useless and should be immediately abandoned. I only wish to communicate that the heavily subsidized deployment of technology which is 10 times less useful to society than conventional sources is not a smart strategy (especially at this point in time). In other words, I would happily endorse hundreds of millions of investment in renewable energy RD&D, but I think that the hundreds of billions being spent to subsidize the rollout of blatantly uneconomical first generation renewable energy technology is very dangerous indeed. The next article will elaborate further on this line of thought.